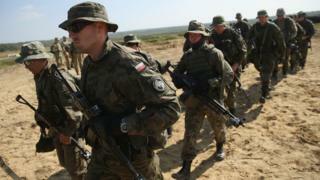 Poland says it will start recruiting in September for a new 35,000-strong paramilitary defence force because of tensions with Russia. Defence Minister Antoni Macierewicz said top positions in the Territorial Defence Force had already been decided. The force will have civilian volunteers trained in military skills. It is aimed at countering "hybrid" warfare of the kind that led parts of Ukraine to break away and pledge loyalty to Russia. Nato also plans to reinforce Poland. One Nato battalion will be deployed to Poland and three more to the neighbouring Baltic states - Estonia, Latvia and Lithuania. The total troop deployment is expected to be about 4,000, on a rotating basis. A Nato summit in Warsaw on 8-9 July will finalise the details of that deployment. Several of Nato's 28 member states will send troops to beef up the alliance's presence in the east, near the Russian border. Russia's annexation of the Ukrainian Crimea peninsula in March 2014 and the insurgency by pro-Russian rebels in eastern Ukraine sent a chill through Nato members who used to be in the Soviet bloc. Russia has also deployed Iskander-M nuclear-capable missiles to Kaliningrad, a territory sandwiched between Poland and the Baltic states. In April, Mr Macierewicz said the new Territorial Defence Force was needed because Poland "is threatened by the actions of our neighbour Russia, which makes no secret of its aggressive intentions and which since 2008 has systematically been undertaking action aimed at destabilising the peaceful order in Europe". On Thursday he announced a September recruitment drive, at a conference of paramilitary organisations in Ostroda, northern Poland. The idea of resurrecting Poland's territorial defence units gained traction following Russia's annexation of Crimea and its support for rebels fighting in eastern Ukraine. When Mr Macierewicz signed the document initiating the volunteer defence system in a Warsaw secondary school in April, he said the units would serve to defend against Russian aggression and to promote patriotism. He said Poland was the only Nato member without such a force. Warsaw abandoned its Soviet-era territorial units in 2008. Volunteers will undergo about 30 days' military training a year and the first three brigades are scheduled to be operational in eastern Poland by the start of next year, with the remaining 14 in the rest of the country expected to be ready in 2019. One of the first three brigades will defend Poland's border with Kaliningrad. The war in Ukraine triggered discussion about the territorial units in both Poland and the Baltic states, which already have them. One of the main concerns is the threat of a hybrid attack, a combination of conventional and unconventional warfare and cyber warfare. The Baltic region has experienced heightened military tension in recent months, with Nato complaining of aggressive behaviour by Russian air force jets. Russian Foreign Ministry department chief Andrei Kelin, quoted by Reuters news agency, said the deployment of four Nato battalions to the region "would be a very dangerous build-up of armed forces pretty close to our borders". Russia has announced plans to send three new military divisions to areas close to its western and southern borders. Military sources quoted by Russian media say they are likely to be motorised rifle formations of about 10,000 soldiers each. Next week some existing Polish paramilitary units will take part in a Nato defensive military exercise in Poland called Anaconda 2016.